This is a regular blog post. If you’re looking for show notes or links to show ausio, please check the other posts. The CAP Form 5 instrument check is tomorrow. 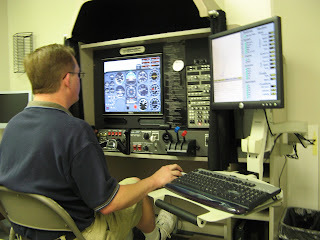 So I headed in the DCT Aviation to fly some sim and do more preparation. As many of you know, I took the Form 5 ride in August in a C-172P. I opted not to go for the full IFR ride because I was unfamiliar with the panel and didn’t want to waste the check airman’s time. As it was, I flew a lot of the VFR checkride on the gages and I think I would have had a 60-40 chance of passing the instrument version of the Form 5, but that’s not how I roll. I don’t like walking in less than fully prepared. Cole, my FO, went with me. As is wise before a grueling sim session, we hit grabbed breakfast. 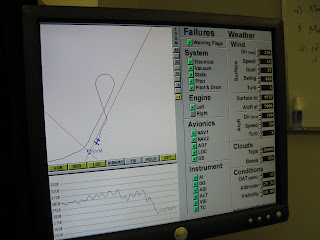 I flew a lot of sim prior to my instrument rating checkride in 2007 and it helped a lot. Not least because the airplane is a heck of a lot easier to fly than the sim. It was so nice to get back in the airplane after flying hours and hours of sim. Anyway, I shot the ILS 23L at KYIP twice, the VOR 24 at KARB twice, and then the VOR A KYIP with a circle to land on 32. Things really improved after the first approach and I seem to have dialed it in pretty well. Some of it was getting the throttle settings for various phases right. It turns out that the sim is pretty accurate in terms of performance. 2100 RPM and 10 degrees of flaps gets you 90 knots maneuvering and about 1700 RPM gets you a nice ride down the glideslope at 90 knots over the ground in most wind conditions. Here’s the inbound leg of the parallel entry for the hold at SVM prior to shooting the VOR 24 at ARB. The simulator doesn’t lie. There are parts of my flying that I like and parts that I don’t. The turn here was nice. The outbound leg was offset very uniformly, which tells me that I just accepted the offset all the way out without correcting. Not the worst thing in the world, but I should be better on that. Altitude is very sawtooth-looking, but I’m not going to complain about that. I’ve never met a sim that was any good whatsoever in pitch. Pitch works so much better in the actual airplane. Here’s how Cole spent much of the sim session. 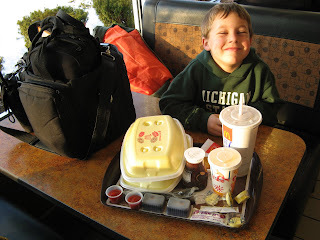 When I flew sim at DCT in 2007, Cole came along and sat at a desk and watched DVDs on a DVD player that I brought in. DCT has taken this idea to heard and there’s a DVD player in the sim room. You can bring your kid along, hook him or her up with headphones, and let him or her watch DVDs while you fly. 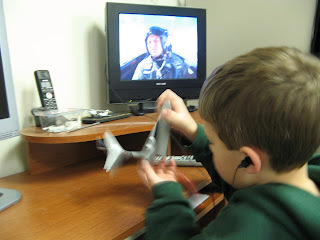 Cole’s watching Fighter Pilot: Operation Red Flag. For the 20th time. Not kidding. And he loves it. Love my boy, I do! If you’re near Oakland County International Airport (KPTK) and you want a really good and friendly sim environment to polish up for a checkride or anything else, check out DCT Aviation.